A PAIR of Dynamics Carts / Collision Trolleys. These are the same carts as our part number MF0945-001 but they do not include the 'firing pin' which is used for recoil and similar experiments. The lack of a 'firing pin' makes these carts 'extra safe'. Designed and made in Australia by IEC. The anti-twist rigid body is made from durable, strong ABS. 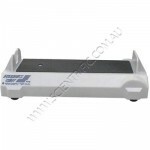 The carts have many enhancements including very low friction wheels which are widely spaced for stability while still being within the body line. Each cart has an accurate total mass of 450g. Size: 310mmL x 130mmW x 90mmH. These carts have been copied in China so closely that they are almost indistinguishable from the original – even down to the label colours and text fonts. If you ever need to check that you have bought the originals, look for the IEC hexagon on the underside to be sure of: faultless assembly, a straight housing and very free-running wheels. The copy will have none of these features.